No it’s not a movie genre, but one of my favourite jerkbaits of all time! 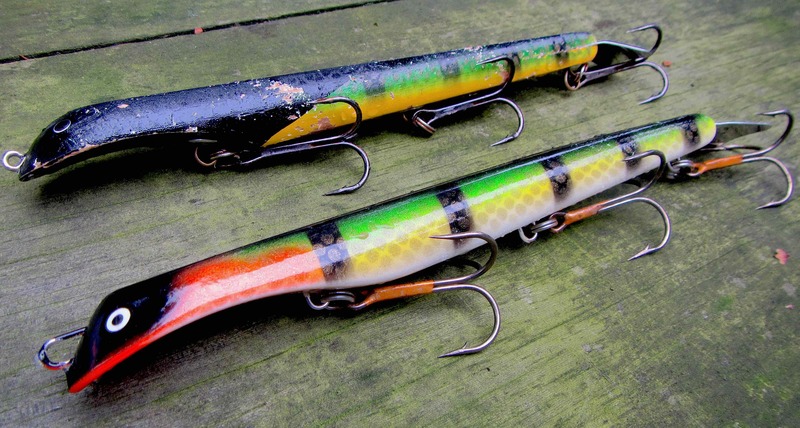 The Suick Thriller is a one of a kind, unique lure. Thriller’s come in various sizes from 4 to 12” in length and and can be categorized as jerkbaits, or pullbaits to be more specific. 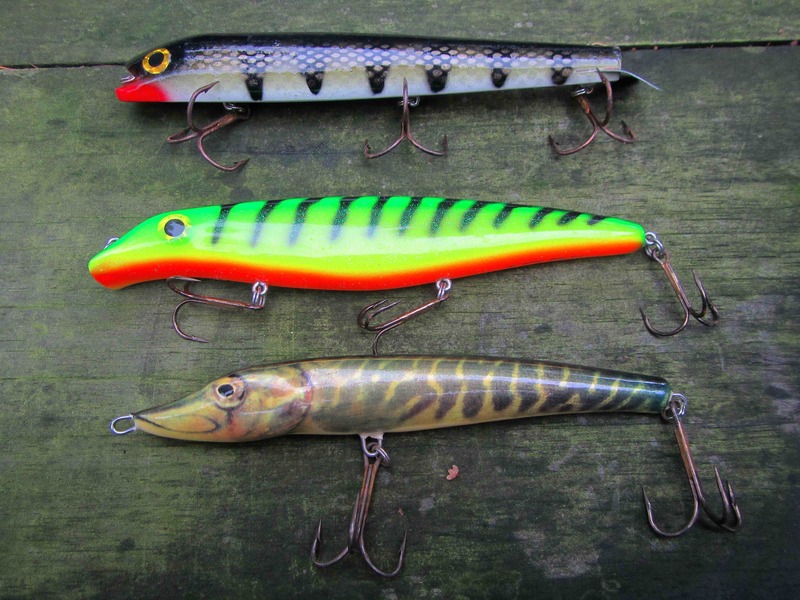 There are many pullbaits on the market available to buy. The Salmo Jack, Bobbie Bait, Musky Mania Burt, Big Fork Lures Sandcat to name a few, but probably one of the most famous and well known is the Suick Thriller. Or should I say unknown? It always surprises me when I stumble upon anglers who have never heard of the name before. Or have heard, but never took the upportunity to fish one. The birth of the Thriller dates back over 70 years ago, when Frank Suick began whittling with a jack knife on a piece of cedar. His handy knife work developed into one of the all time classic jerkbaits. The Suick Muskie Thriller was born! I first encountered a Thriller in my local tackle shop several years ago. Before this, I’ve read alot about this lure, and why it would produce so much fish. If you take a closer look at the body of any sized Thriller, you may notice that it has a fairly narrow tapered shape, unlike a Bobbie Bait, who’s body is much wider. If you have ever fished with a Bobbie Bait, you may notice the high boyuncy of the lure. You really need to work this bait in order to get it below the surface, running as you want it to. It’s a nice lure, but nothing beats the action of a Thriller. If you first look at one, it may look like a walking pencil with a bit of colour added to it. But if you look closer, the action is like no other! I’ve fished with all kind of different pullbaits, but I always come back. The catch-ability of this lure is outstanding, and amazes me each time. It’s my go to lure, when the fishing is slow, or when the bite is off. It has never let me down, it even caught fish on high pressured waters, so that should say enough right? From top to bottom: Bobbie Bait, Sandcat, Salmo Jack. If you want to buy a Thriller, it’s good to take a closer look at wich purpose you want it to fullfill. As mentioned before there are many different sizes available. Most Thrillers are made of wood. Back in 2013, a new Thriller was brought to the market by Suick. This was the HI Thriller, made from hi impact plastic. If you have never fished with one before, I would highly recommend you to buy the original 9” weighted version. This was the original one that started the legacy back in the days, and for a good reason. It’s made from wood, and has a great action. You may notice on all Thrillers, there is a metal tail attached. If you bend this tail, you can make the lure dive or rise. If you bend it down in a slight angle, you may notice it dives deeper that in the original setting it comes in straight out of the box. For me the ideal angle is around 45 degrees. This way the lure will run about 5 feet, wich is more then enough on most occasions! If you bend the tail upwards, you will have a topwater. Now the lure will swim upwards as the water and the movement of the rod pushes the lure to go up, instead of down. How do you reel it in? I’ve found out over years of usage, that a fast reel is much more suited for the job than a slow retreive of let’s say 5.3:1. I use an Abu Garcia Ambassadeur C4 for this. The 6601 type of this reel has a retrieve ratio of 6.3:1, wich immediately leads you to one of the key things to fishing a Thriller, slack in your line. Fishing a Thriller you should never let your line become slack, at least that’s how I like to fish it. If you get a fish on, you will lose it because of bad hookset. It’s really easy to fish one, but you need to get the ”hang” of it, and ”hang”, that’s what any Thriller will do, and why I love it so much. A wooden 9” Thriller and the HI Thriller made from hi-impact plastic! Let’s do step by step. You fish with rod with maximum 6ft in length, and a casting weight of around 3oz (i use a St.Croix Premier Musky). You cast in the Thriller, having set the tail at around a 45 degree angle. Hold your rod at 8:45 and while reeling in, bring it back to 5:30. Get it? 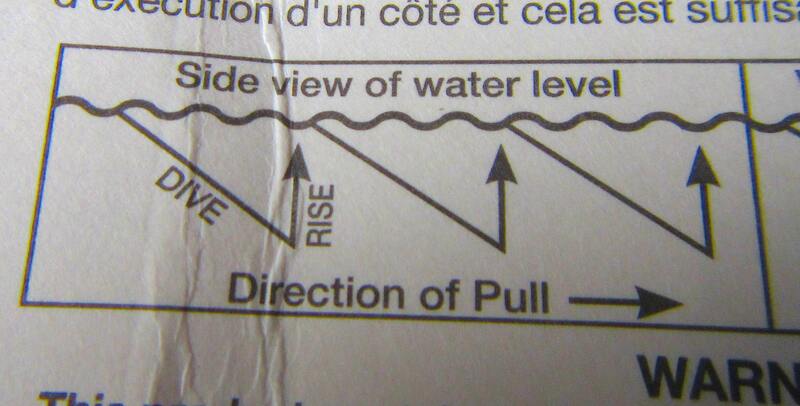 So basically you start making short 2 foot pulls with your rod, keeping tension as you are reeling in any slack. 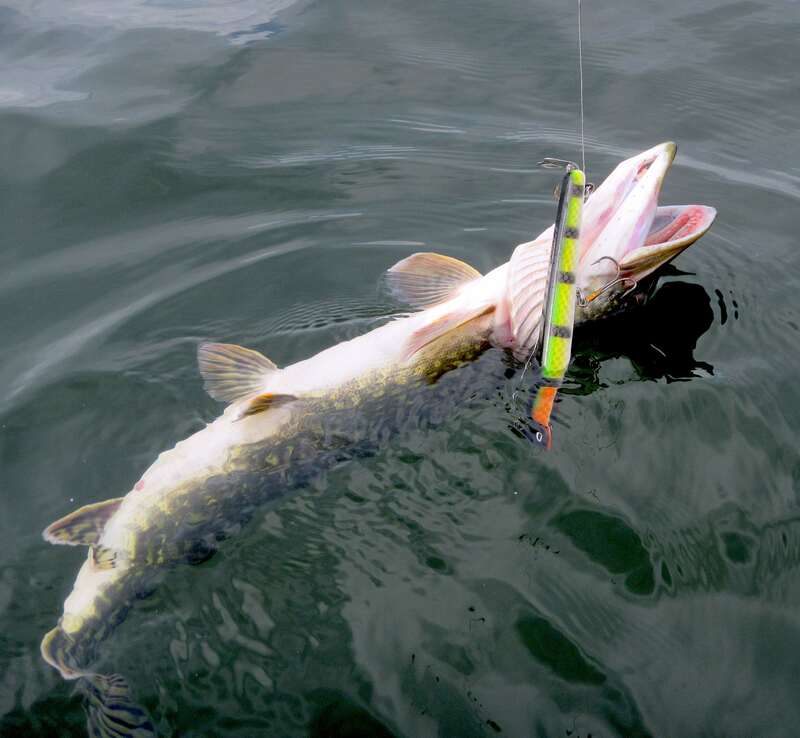 When you pull, the lure will dive down, when you bring your rod back up to 8:45, the lure with slowly rise. When you are doing it correctly, you will feel a bump on the other end of your line when you are bringing your rod tip down. You now have direct contact with the lure, and direct contact to any encountering fish! Once you know how to fish it, based on this small tutorial, and the description on the back of any Thriller’s package, you can start playing around with the action. How a Thriller should be fished. Wooden Thrillers have a different action that the HI Thrillers. Wooden Thrillers come in weighted and unweighted. Weighted means that if you pull the lure down, it will come up in a steady way. Unweighted means that it doesn’t. I own a 10” version that is unweighted, and the action wasn’t quite like the 9” weighted version. But the fish love it, because it has great side ways belly roll, and quick rise and present, wich simply cannot be ignored. This one is particulary used when fishing for Pike in a river. The fish will noticed quickly something is there, and the strikes are hard. The 9” weighted version (also available in unweighted) has some ”hang” time because of it’s balanced weight. It has a great tail waggle wich Pike simply cannot resist! The only downside to fishing with wooden lures is, that once a fish grabs it, the teeth have some sort of grip on the wood, wich ”can” result in bad hookups. With the HI Thriller this is no problem, because of the plastic it’s made from, teeth will immediately slide onto the hooks. This version also has another great feature, an amazing side to side belly roll. If you pull it down you may twitch with your rod tip, and this way it will perform a great belly flash and waggle, it rises slowly because it has the same boyuncy as a weighted Thriller, wich makes it irresisteble to Pikes! Learn how to fish it properly, and gain trust in using it. I’m sure it won’t let you down! What are you waiting for? Put on a Thriller and Hang On!! This nice Pike fell for the belly roll on the HI Thriller in Perch colour.